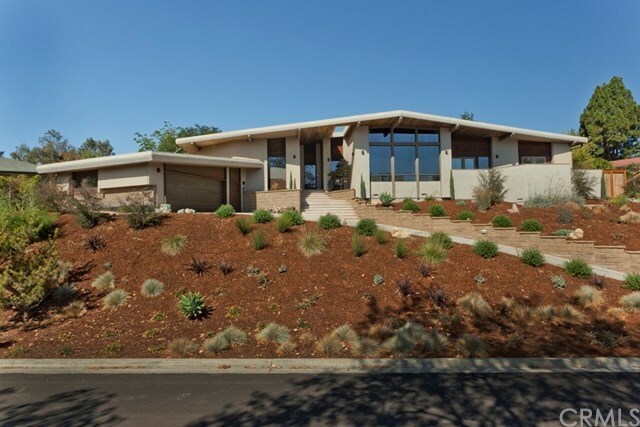 Stunning southwest, single-level, contemporary home designed by John Mitchell. Located on a quiet, tree-lined cul-de-sac, this home can be a private artist's retreat or an entertainer's dream. Spacious kitchen opens to great room with vaulted ceilings, wood-burning fireplace and floor to ceiling windows which invite views of the Santa Lucia hills and abundant natural light. Enjoy your coffee and the sunrise from the deck off the master bedroom and dining room. Backyard is private with every room opening to the back patio and plenty of room for outdoor dining under the pergola. Whether you're into BBQ'ing or meditating, it's the perfect, low-maintenance outdoor space. Floor plan includes 3 bedrooms and 2 full baths, great room, formal dining room with wet bar, family/media room, updated kitchen with breakfast nook, laundry/mud room off garage and approximately 2,542 sf of living area. Walk to Los Ranchos Elementary School and San Luis Obispo Golf and Country Club. Directions: Broad St south to Los Ranchos Road, right on Country Club Drive, Left on White Oak, right on Countryside Ln.